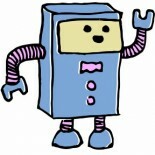 Creatabot | Creatabot is a project that connects, promotes and supports creativity. Based in Medway, UK. Natasha Steer, the maker of Creatabot, runs various workshops in the community and specialises in designing bespoke creative workshops for all ages.